MRC is a coaching institute in Bhopal for preparation of JEE Main, JEE Advanced, Board and School exams starting from 6th to 12th classes. We focus on building a strong foundation of knowledge and concepts in students. Which provide them an excellent platform for various school and competitive exams. The best academic support, systematic and comprehensive study material, Test Series program and individual attention provided to the students helps them to meet their career goals and objectives. All these factors make it best coaching institute in Bhopal. Experienced and best faculty team, who are hard working and passionate towards your success. Systematic and comprehensive study material for knowledge and concept development. Specially designed study hour sessions to complete the assignments/tests or quizzes. Regular doubt clearing sessions to improve the performance and efficiency of students. Rigorous test series for each and every subject covering all topics separately for JEE Main, JEE Advanced, School and Board exams. Excellent infrastructure with fully Air conditioned class rooms and well equipped library. With our students in mind, we work meticulously to provide the best courses for them! Rathi sir helped me a lot. The rigorous practice provided in the class helped me a lot. The guidance provided by Rathi sir helped me to get the correct mindset that a child needs to crack JEE. I am thankful to Mitesh Rathi Classes for their support in my path to JEE. The study material provided was vary useful, and specially to the point for JEE preparation. The entire faculty team was co-operative and knowledgable and always ready to help. I would especially thanks rathi sir for his guidance and efforts. The test series and study hours conducted by MRC is very much effective. In the two year program, there is always a learning environment. Faculty provided effective learning in this program. I would like to give the credit of my good score to my parents, god and Mitesh Rathi Sir and their entire core faculty members, there is an adequate environment for IIT preparation. All the faculty members of Mitesh Rathi Classes were vary helpful and have played a big role behind my selection in IIT- JEE exam. The study materials provided by them covered all the parts of the courses and the test series conducted by them has helped me alot, I am thankful to mitsh rathi sir and his team who has guided me so far to achieve my dreams. Thank you very much Mitesh Rathi classes. I am heartly thankful to Mitesh Rathi sir and his team for providing dynamic guiding support and help to each and every point of time during my preparation. Undoubtedly my result is an outcome of their hard work. Rathi sir focussed guidance and conceptual efforts helped me to crack IIT-JEE and get a good rank. The best part of our studies in Mitesh Rathi Classes is completion of syllabus on time and proper revision of all the topics, because of this my confidence level has increased tremendously. The Atmosphere here is very competitive and supportive. The rigorous test series are helpful in complete revision of syllabus. All the faculties are very supportive and always there for any doubts. Test series in MRC are very helpful for preparation for advanced. They are designed exactly such a pattern which is asked in exam. I am extremely grateful to all members of MRC who helped me to get a good score. Test series conducted were helpful in the identification of our weakness and gave opportunities to improve. Improvements piled up to create confidence and face the competition. I am really thankful to the team of MRC for their innovative way of teaching and continuous hard work which made it possible for me to crack JEE. I am very thankful to Mitesh Rathi Classes for their continuous support in each step of my preparation. The refined test series give me the actual explores for IIT JEE. All the faculty member are supportive and helpful. MRC is the best coaching classes. Rathi Sir's dedication to the subject and students helped us to perform well. Study material provided here is very useful in preperation of exam. MRC ki series bahut acchhi hai aur study material bhi bahot achha hai yanha ka pakage or CRQ kar lene ke alawa hume koi aur book ya package nahi karna padta hai aur yanha ka diciplane aur padhai ka mahoul bahot achha hai. The competitive environment of MRC is vary good, specially the discipline level, this help me a lot to concentrate in my preparation and keep my interest level in studies. MRC has been really supportive towards me. From nowhere in this new city they have lifted me up to a level where I can dream to be in top 10 ranks of IIT. Really thankful to Rathi Sir. Hope so give institute back at my best. I am highly thankful for MRC classes for guiding me throughout my session. This institute provided a competitive environment for better approach towards test series and doubt clearing and study hours conducting helped me in polishing my talent. Study hours in the MRC are so beautifully designed which helped me in revising the topic thoroughly. The syudy atmosphere of study hour is very helpful in understanding the atmosphere of IIT-JEE. Study Environment in MRC is quite good. The competitive exam created by regular test series .The division of batches also encourages student to give them best. I am vary thankful to all the faculty of MRC. The test series and study material are vary helpful for improvement of our knowledge. Strict discipline in MRC helped a lot kin my studies, concept of study hours is god, balanced CRQ and packages are also of great help. The faculty members of Mitesh Rathi Classes are very helpful. The test series are well organized which provides a quality of problems for a smart preparation. The guidance provided, helps us to achieve a lot and to correct our mistakes day by day. This coaching (MRC) provide us an natural environment of study here test series is very effective and guidance given by teachers is extra ordinary. Speed test organized by Rathi Sir help me to improve my speed in main exam. are very helpful to cover all topics in short time period. I am very thankful to Mitesh Rathi Classes for their continuous support in each step of my preparation. Weakly Test series, competitive Environment, good doubt clearing. Test program of MRC are very helpful and faculty of MRC are vary supportive, The way weeklty test other then test series helped us to archive a good rank in IIT. 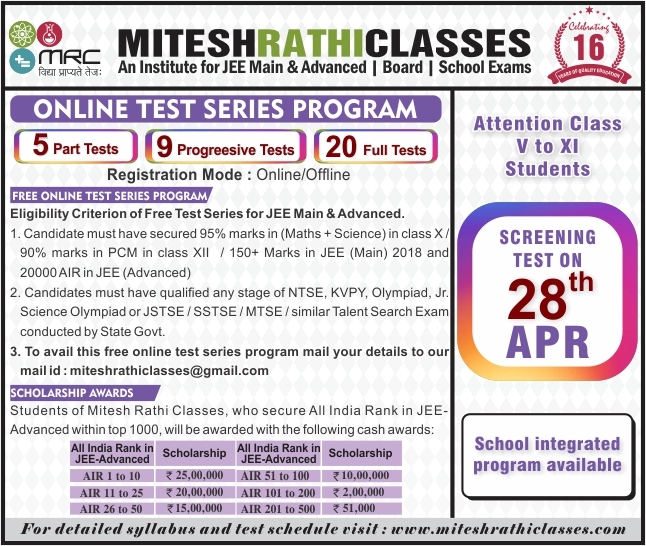 I am very thankful to Mitesh Rathi Classes for providing me assistance which helped me a lot in clearing JEE exam with a good rank. Environment of MRC is very studies. Test series is very well equipped and study material is of high quality.